Since air contains around 20% oxygen, even the most oxygenated water rarely contains more than 1% dissolved oxygen. Fish have special organs - branchiae - which allow them to extract most of this (see Anatomy and Biology, page 42). Oxygen contributes, in addition, to the respiration not only of plants but also of organisms which are invisible to the naked eye and often forgotten: the bacteria. The latter transform the organic matter emitted from living beings (excreta and various other residues), and these chemical reactions similarly require oxygen. 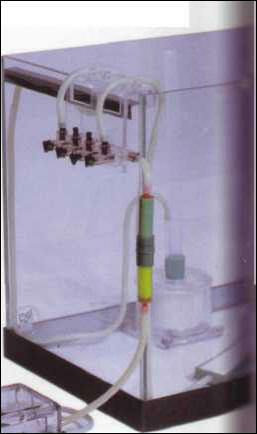 Simple agitation systems stir the water, enhancing the diffusion of the oxygen required by fish. The oxygen in water comes from the dissolution of the oxygen in the air, a process enhanced by movements in the water produced by wind, currents, or downward flow. The more water is stirred, the more it is oxygenated. Plants also provide oxygen, which they produce through photosynthesis, although this process occurs only by day. The maximum amount of oxygen that water can contain is determined by its temperature: the higher this is, the less oxygen the water can contain (at 25°C there is 18% less oxygen than at 15°C). Oxygen is measured in mg/liter, and its control is quite a complicated matter. The most turbulent, and therefore the most oxygenated, water contains 8-10 mg/liter, while the most deficient water sometimes has less than 2 mg/liter. The oxygen content in an aquarium is usually at its maximum, providing the recommendations for stirring the water are followed. The rare problems which do occur are the result of negligence as regards the overall balance of the aquarium (overpopulation of fish, small number of plants), or non-functioning of equipment due to forgetfulness, breakdown, or a power cut. Carbon dioxide derives from the respiration of fish, plants, and bacteria. Stirring the water enhances its oxygenation, thereby reducing the levels of carbon dioxide in the water, and passing it into the atmosphere. Carbon dioxide is quite rare in an aquarium, and this can, to some extent, prove prejudicial to plants, as they absorb it by day through photosynthesis to extract the carbon they need to grow. It is therefore vital to establish a permanent equilibrium between oxygen, carbon dioxide, plants, and fish, although this balance changes at night, when plants stop producing oxygen. Carbon dioxide is also one of the main factors affecting the pH. ТАНАНАЕВ Иван Владимирович (1904-93) , российский химик, академик РАН (1991; академик АН СССР с 1958), Герой Социалистического Труда (1984). Труды по неорганической и аналитической химии фторидов, ферроцианидов и фосфатов редких элементов, физико-химическому анализу. Государственная премия СССР (1949, 1951, 197..1).